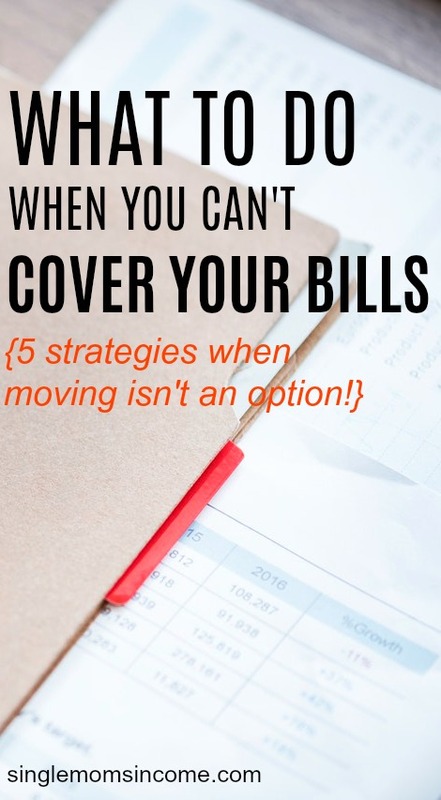 It can be a frightening feeling to realize you don’t have the money to cover your bills for the month. Sadly, many Americans experience this daily. It’s a tough position to be in especially if you reside in a high cost of living area. Your rent or mortgage will usually be one of your highest expenses. In the past, I’ve moved quite a few times to keep my cost of living low and my expenses manageable. However, I realize everyone doesn’t have the option or luxury of just packing up and moving. If your housing payment is high but you need to stay put for whatever reason, here are some other steps you can take to turn things around when you can’t cover your bills. So maybe you can’t find more affordable housing or refinance your mortgage right now. That just means you’ll need to go through your other large monthly expenses with a fine tooth comb. Take a look at your spending and see what other items dominate your income. For many families, transportation, food, and childcare are all heavy expenses that can create quite the burden. See if you can lower any of these costs to get some relief. This may mean cooking more meals at home using whole ingredients because it’s cheaper, finding a reputable babysitter instead of paying for summer camps, or even selling your car and buying an older one in cash or using public transportation. You can focus on cutting back on smaller monthly expenses too like your phone bill, gym membership, an auto insurance but you’ll notice a big difference instantly when you start focusing on the big expenses. High utility bills can eat up a lot of your disposable income which makes it difficult to pay all your other expenses. Try your best to make your home more energy efficient and insulated, then see if you might qualify for any energy assistance programs. The government has quite a few programs to help get help paying for their telephone service, medical bills, prescriptions, and home energy bill. You do have to meet certain income guidelines but you can find more info here. You can also look to community organizations for help like a Community Action Agency (CAA). These organizations receive funding from Federal Government grants, but most of the money gets passed down to local groups in cities and towns across the country. They can provide referrals or even direct resources and assistant to you. Finally, you can talk directly with your utility company to see if you can get a fixed billing plan. If your energy costs tend to shoot up in the winter or summer, you might want to consider getting one fixed bill each month so you can better prepare for the expense. If you run the numbers and a fixed billing plan seems like it will be cheaper, give it a try. This may not be an ideal option for everyone, but if you can make it work, it could significantly cut your housing costs until you’re able to get back on your feet financially. If you have a spare bedroom or basement, you can rent it out to a friend or even consider becoming an Airbnb host if you live in a tourist-heavy area. Last month, I stayed in an Airbnb in Long Beach and had a really nice conversation with the host about her experience sharing her home with Airbnb guests. She casually revealed to me that she makes around $2,000 per month with Airbnb rentals which covers a majority of her bills. Must be nice! It’s important to use a budget no matter what your financial situation is, but if you’re struggling to pay bills having a budget is crucial. A budget helps you determine exactly where your money is going which is important if you already feel like finances are tight. Having a budget and tracking expenses can help highlight some areas of you might be overspending in so you can avoid it for the future. Using a realistic budget means you can manage your money more intentionally and understand which expenses you can do without in order to free up more money. Using a budget doesn’t have to be a major hassle if you don’t make it out to be one. I’m not fancy at all with mine and just use a basic spreadsheet to lay everything out so I know where I’m at during the month. If you’re truly struggling and can’t pay your bills, you can only cut and manage expenses so much. Being able to make some extra money could make a huge difference. You might want to start by picking up extra shifts or finding something simple that you can do on the side to earn some quick cash. Here’s a list of plenty legitimate ways to make money on the side. When you start making more money, you have to de disciplined and put it to good use. Pay off your debt, catch up on bills, and stash anything extra away in a savings account. Some extra income ideas are sustainable long-term while others may only be good for a specific season in your life. This is why it’s best to act quickly and stay focused so you won’t have to struggle in the future. In addition, think about your long-term plan. Once you get back in control of your finances, think about what you can do to avoid getting back into such a scary and uncertain situation. Consider how you can increase your income long-term, pay off debt for good, and start building an emergency fund. 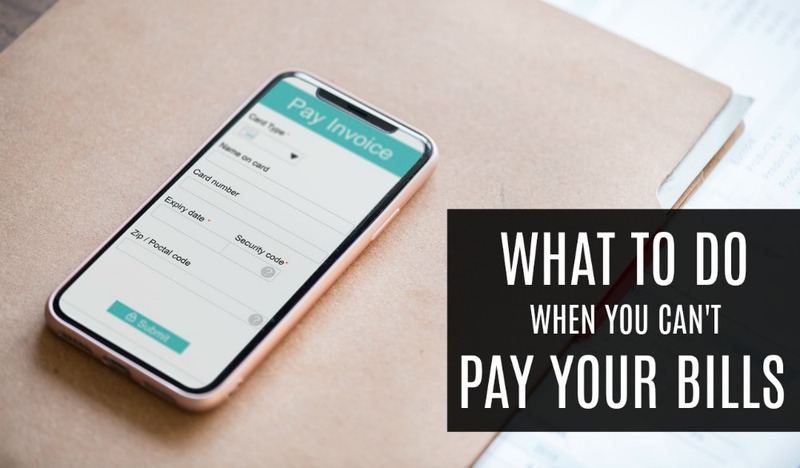 Have you ever struggled with paying your bills or do you know someone who has? What strategies did you use to improve your situation? Fantastic tips! Especially about seeking out resources. There are a lot of companies that don’t outright advertise that they have resources for low income/assistance and you have to ask. If you have a good history with your apt property managers or house owner, it might be possible to negotiate “split payments” too on months when your first check is too low to cover rent and all the other bills.